CPQ software offers several distinct advantages to product development teams wrestling with the evaluation of new product ideas. New products should drive new sales, new customers, new markets and additional revenue. CPQ can help maximize the new revenue and reduce the expense involved in developing and rolling out new products. If you mention software and product development in the same sentence, most folks will immediately think about project-management and process-automation systems. This is perfectly understandable because the process of managing and developing products is complex, and these tools are critical to the development process. But, the ability to efficiently manage that process doesn’t get the job done by itself. Product managers and marketing folks will frequently identify opportunities for new or improved products based on what existing products do not do. On the surface, those opportunities may seem compelling enough to pursue. Customers themselves will originate ideas for new functionality or entirely new products as well. These ideas are based on their own very real needs or desires. The question for these ideas is whether the customer should subsidize the upgrade as a modification or customization to their product, or if the new capability should be productized for general sales. On the engineering side of things, product opportunities are also observed and developed during the prototyping and product development research processes. Although these may be the products of intentional research, frequently they may be exposed through the serendipitous result of some completely unrelated development activity. Regardless of where the product idea originates, it still needs to be carefully evaluated in terms of its marketability. There are likely many thousands of “great” product ideas that made sense to someone, but unfortunately not to any potential buyers. There are also many great ideas that are turned into perfectly performing products, but they are not feasible from a financial standpoint. The value delivered is demonstrably less than the money required to purchase the product. Engineers and product managers understand these requirements and how they may ultimately turn good ideas into bad ideas. There are ways to minimize these risks and separate winners from losers early in the development process. Products are typically developed through an evolutionary process. A basic product is brought to market and successfully sold. Then, as it is used by customers, supported by field engineers and evaluated over time by marketing people, usage limitations and performance gaps are identified. Each limitation or gap represents a potential new product or feature. Consider pump manufacturers as an example. Acme Pumps makes a series of products designed to handle liquids in 10-, 50-, 100- and 500-gallon-per-minute capacities. In addition to volume or capacity, each pump is rated to handle specific types of liquids. These capabilities are illustrated in the chart below. Each white space on this chart, that is spaces not filled with an X, represents a potential product or feature development project. For CPQ users, this information forms the basis for the scripted interactive interview questions that drive the configuration options available for selection by the buyer. 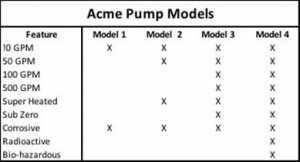 When Acme Pump’s product managers are evaluating development projects for funding, one of the first things areas should consider is how these questions have been answered over the course of recent history. Are prospects asking for combinations that do not exist? For instance, referring to our chart, have there been requests for 50 GPM pumps that can handle subzero liquids? Are there requests for radioactive or bio-hazardous material pumps rated at less than 500 gallons per minute? CPQ can provide that type of data to development teams. Additionally, coupling that information with win/loss reports is useful in identifying lost opportunities due to buyers not willing to overbuy pump capacity in order to attain pumps that are capable of handling some particular type of material. The usefulness of CPQ for this type of research is not limited to white-space charts. Other factors built into the configuration scripts will reveal conditions that might signify the viability of new products. These conditions would include regulatory inquiries and customer-projected growth targets. As regulations change, scripting must change as well to reflect the new regulatory requirements. These additional data inputs can form the basis of research into previous transactions that would have been impacted by the changing regulations. Customer requirements may change as their own markets evolve and the fact that increases in demand might impact the utility of the product installed at the customer site. The potential market for these options can be estimated based on the sales lost due to the unavailability of the option requested or those customers affected by the regulatory change. This along with more traditional market-sizing data sources will provide a complete picture of the market potential for the product under evaluation. The effective execution of the rollout phase of new or upgraded product offerings is critical to successfully launching new features and new product. Training the sales force to be conversant and knowledgeable about a new or upgraded product can be time-consumptive. Bringing the team into corporate for extensive training usually means the customers and prospects will be all but ignored while the training meeting is underway. Additionally, promotional aspects of the program, especially those involving pricing incentives, have the potential to be misunderstood, if not overtly misused, to close sales for unrelated products. An incentive such as a 20% discount for new users of your new widget may suddenly be extended to include a 20% discount for anyone buying the new widget. 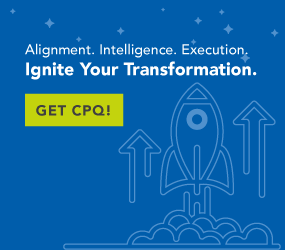 CPQ is uniquely set up to address both of these expensive aspects of new-product introductions. The scripted interview questions properly updated within the CPQ interactive interview will reflect all the information necessary to apply the new feature properly within the context of a sales conversation. The sales rep doesn’t actually need to understand the technical aspects of the new feature, they just need to read the questions and apply the responses to ensure that a proper product configuration is developed. Similarly, promotional pricing programs can be implemented, using the pricing facility within CPQ to ensure that any discounts extended are only applied to the products and options included within the promotion. All of the restrictions, applicable conditions and other constraints may be controlled via CPQ. The ability to modify those restrictions resides at whatever level the administrative user determines. Regardless, discounting is effectively limited and managed according to the needs of the manufacturer. New product development is exciting and indeed a critical part of any market success enjoyed by manufacturing companies. New products should drive new sales, new customers, new markets and additional revenue. CPQ can help maximize the new revenue and reduce the expense involved in developing and rolling out new products. CPQ helps to facilitate the development of products that are responsive to market needs by using end-user and customer inputs to identify and measure market receptiveness. Additionally, CPQ aids in the rollout process by helping experts digitize, encode and include their expertise into the sales conversation with the customer. Training field sales and support personnel is simplified with CPQ by building new knowledge into the AI that drives the interactive sales interviewing process. Finally, pricing and promotional programs are more effectively managed using CPQ to drive the availability of pricing based on specific classes of customers, prospects and products offered.